The American Hockey League has begun announcing the 2015-16 year-end awards. As the media representatives for the Texas Stars, Stephen Meserve of 100 Degree Hockey and Sean Shapiro of the Austin American-Statesman submitted a ballot for each award. Over the next week and a half as the AHL announces the winners, they’ll break down their choices. Today’s ballot: the All-Stars Teams. Before we break down each position, it’s important to note that we aren’t allowed to vote for Texas Stars, since we cover the team. And, due to the nature of the AHL scheduling, we haven’t seen an Eastern Conference team or player this season (Texas has played three Eastern Conference teams all-time: the Hershey Bears, St. John’s IceCaps, and Syracuse Crunch). Stephen: It was sort of a foregone conclusion who would win here. If you were looking at Peter Budaj’s numbers with no knowledge of which team he played on, you might even think he was playing an NHL schedule of games. Despite only 68 games in the Reign’s schedule, Budaj has played a whopping 57 to this point in the season. When you add in the fact that he is 39-14-4, it’s no question who is the best goalie in the league this season. The Reign are a very good team but the goaltending bails them out as much as they hold up the for Budaj. His play in person was phenomenal to watch, and I think Sean and I agreed very quickly after seeing him in Cedar Park that we would be voting for him on this ballot. We extolled the virtues of Juuse Saros yesterday in our AHL All-Rookie post. Neither Sean nor I have seen Matt Murray play in person, but by all accounts he is exemplary. Unlike last year, the added factor of how many games he had played that season and the fact he was a rookie didn’t tip us this season. Saros had those working for him and got the nod as a player we’d actually watched. In the final slot, we went with an emotional career achievement pick. Michael Leighton set the AHL record for all-time wins this season. He’s been a rock for the IceHogs at 28-8-8, 2.44 GAA and .918 SV%. He certainly earned recognition in our eyes on those stats especially when you combine it with the overall career he has had and the milestone he hit this season. Sean: Of the four defensemen named to the first or second All-Star team we voted for three of them. And if you’ll remember back to yesterday, we had two of them on our All-Rookie ballot as well (Montour and Russo). Brennan and Russo were no-brainers for us. Brennan has been incomparable as an offensive force from the blue line and has been very good defensively this season. He’s also posting better numbers than he had in 2013-14, when he won the Shore Award as the AHL’s best defenseman. Russo is going to finish as the league’s plus/minus champion, that’s a given. The only question remaining is whether he can become the first AHL player to hit plus-50 since Y2K. We had Montour lower than Russo on our ballot because of the body of work. While Montour is a skilled offensive player, he’s not as reliable in his defensive zone as Russo or Connor Carrick. Carrick is now a member of the Toronto Maple Leafs after he was traded before the deadline. But his time in Hershey was more than deserving of second-team honors. In 47 games with the Bears he had 26 points (10 goals, 16 assists) and was plus-23. For the final two players on our ballot we went with Grand Rapids defenseman Xavier Ouelette and Portland Pirates defenseman Cameron Gaunce. Ouelette passed the eye test for me and was an AHL All-Star selection in Syracuse. Gaunce is a former Star we saw quite a bit of over the past two seasons. This season with Portland he was a leader on a good defensive team and added some offensive spark with 34 assists, which is more than he had in two seasons combined in Texas. Stephen: It’s something of a given that the league’s leading scorer should be on the All-Star team. We certainly weren’t looking to buck the trend (at least not on this particular award) and went with the crowd. Chris Bourque has led the Hershey Bears by a country mile in scoring this season. He has 20 points on the next closest competitor in that regard. Among all players in the AHL, Bourque sits comfortably ahead of the pack with six points between him and fellow All-Stars TJ Brennan and Seth Griffith at 67. We were 2-for-2 here with Mikko Rantanen. Sean said a lot about Rantanen yesterday, so I’ll keep it brief here. It’s good to see that the league overall recognized what Rantanen did for the Rampage. While they may not make the playoffs, his impact was huge for that club despite limited work. In the final left wing slot, we had Michael Mersch. The former Rookie of the Year continued his strong play as one of the best players on one of the best teams in the league. He potted 23-17=40 in 48 games with a plus-12 rating. Again, we can’t vote for Texas Stars since we cover the team. If we could though, Brendan Ranford would have made the ballot. In a season of injuries and callups for the Texas Stars, Ranford was a consistently excellent offensive force for the club. He’s tallied 19 goals and 39 assists, both career highs, and hasn’t missed a single game this season. Sean: This is the only position where we didn’t vote for either the first or second team selection. While Vatrano was a superb rookie and was on our all-rookie ballot, I’m under the belief for the AHL All-Star teams you need to have more games played and showed consistency over the course of the season. (It’s not a set rule, but I look at 40 games as a good bench mark). Dustin Jeffrey is a former Texas Star, who we did not vote for. Jeffrey’s numbers were good this season, but we felt the three players on our ballot had a bigger impact on their individual teams. Arcobello had 55 points in 45 games with Toronto and helped set the table for a young group of prospects that have turned the Marlies into a team to beat. He’s one of hockey’s more well-traveled players in the past two seasons, but when he’s in the AHL there aren’t many players you’d rather have. We had a similar thought behind putting Miele on our ballot. He has 58 points in 70 games and is one of the emotional leaders on a Griffins team that went from a horrendous start to piecing together a pair of long (13 and 15 games) in streaks. For a Stars fan perspective, Miele and Arcobello are the Travis Morin of their respective organizations. For our third spot we went with Charlotte Checkers captain Derek Ryan. Ryan came back to North America this season after spending time in Sweden and was the SHL league MVP last season. The 29-year-old has 55 points in 70 games and made his NHL debut with the Hurricanes (and scored on his first shot). He’s been a catalyst for a Charlotte team that could steal a playoff spot from the Pacific Division via the crossover. Stephen: Alright, while we can’t vote for Texas Stars, I think you can see from our ballots that there is no restriction against voting for former Texas Stars. In fact, sometimes we lean on it (especially in the East) as a guidepost for how other players stack up. Sean Backman is a former Star who has gone on to great heights since leaving Texas. After success in Bridgeport, he won a Cup with Manchester and now skates for Ontario. We selected him as our top right winger. 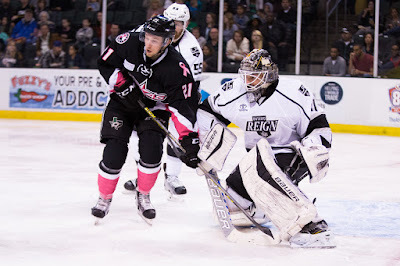 He ranks 13th overall in scoring in the league and is the top scorer on a very talented Reign squad. If we voted for Michael Mersch (40 pts in 48 GP), I think we almost had to vote for Backman (55 pts in 64 GP). He also leads the league’s best power play team in power play goals. While the league doesn’t release any information about runners up, I would suspect Sean Backman is #3 in voting. The two winners, Sislo (who we voted for) and Griffith (who we didn’t), were out East. Finally, we had a bit of a debate on the final spot on the right wing ballot. In addition to our final pick, Martin Frk, we also debated Matthew Ford and Danny Kristo. For better or worse, the Stars really outplayed both the Condors and the Wolves this season and that put a sour note on the candidacy for those two. Frk has rounded nicely into form after riding the ECHL/AHL line last season. He has 42 points in 61 games and will help a dangerous (but streaky) Griffins club in the postseason.